1. 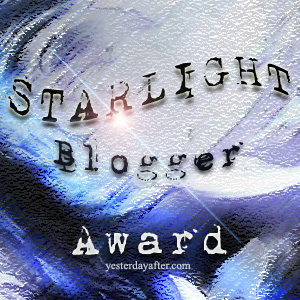 Nominate your 6 favourite bloggers! 2. Thank the giver and link their Blog to your post. 3. Answer the 3 new questions from your nominator given to you. 1. Who made you discover the starlight within you? 2. What would you say is your starlight gift to others? 3. What is the craziest thing you have ever thought of doing? 4. Do you believe in the Omnipotence paradox?